Jazeman Jaafar, a leading Malaysian international racing driver, had a cruel end to his Asian Le Mans Series debut season after his podium hopes were dashed just 15 minutes before the end of the four hour Sepang race this weekend. Jazeman and his teammates finally finished fifth in class, ninth position overall, after technical issues in the final pitstop delayed their return to the track and dropped them down the order. Jazeman had had high hopes for the weekend, the final round of the 2017/18 Asian Le Mans Series and his home race at Sepang International Circuit. After a win and a podium in the previous two rounds, Jazeman expected another strong race – and it was, for most of the race. 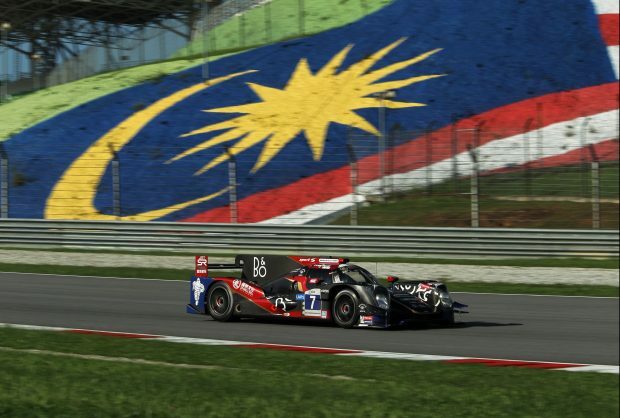 Driving the Jackie Chain DC Racing X Jota Oreca 05 Nissan with fellow Malaysians, Weiron Tan and Afiq Ikhwan Yazid with the support of Sepang International Circuit, the trio were ready for a busy weekend. The race build-up saw Jazeman and his team mates make a whistle-stop tour of Kuala Lumpur with signing sessions for the fans, as well as appearing on billboards around the city promoting the season finale. On-track action started on Friday with official testing, with Jazeman claiming the fastest lap honours of the two Oreca 05 Nissan LMP2 cars. Saturday’s free practice session saw Jazeman continue to show his experience of the Sepang track, putting in the quickest laps in the #7 car and fourth fastest lap overall of the session. In the second practice session Jazeman improved to be third quickest on track, with the sister #8 car taking the top spot. The qualifying session saw Jazeman continue to improve on his lap time and he claimed fourth on the grid for the #7 car to line up alongside the sister car on the second row. The rolling start saw the field sweep across the start/finish line and jostle for position. Jazeman and the sister car both blitzed through at the start with Jazeman slotting in behind the #8 car at the first corner and the Jackie Chan DC Racing X Jota cars started to pull away from the opposition. Jazeman was soon into his stride, settling into a good rhythm and strong pace and moving into the lead of the race by lap 10. He held the lead throughout his track time and out in front, Jazeman took command of the race, setting an impressive fastest lap of the race towards the end of his stint. Handing over to Afiq, the #7 car dropped back to second place and as he neared the end of his stint, it was a 1-2 for Jackie Chan DC Racing X Jota with the #8 car leading the #7 car and just over an hour until the chequered flag. Weiron took over the driving duties for the final hour of running, but with the rival Ligier reclaiming the in the round of pitstops, the #7 had dropped to fourth place. As the clock wound down, Jazeman still had expectations for a podium, but a technical issue prevented the car re-starting in the pits and the crew had to spend valuable time resolving the issues, dropping the #7 car back to ninth place at the finish. Jazeman said of the weekend, “What a rollercoaster for us. We were on the pace and looking really strong for the podium, but the endurance factor crept in and after running so close to the end, we succumbed to an electrical problem that put paid to this. You just never know right until the end in this type of racing and for us, it was a great shame. For me it was a good weekend overall as I was quick in every session and had the fastest lap of all the drivers in the field in the race.